At the ASEAN Summit in the Philippines earlier this month, Russian Prime Minister Dmitry Medvedev said that cooperation between Russia and members of the Association of Southeast Asian Nations (ASEAN) has great potential. Closer trade ties between Russia and ASEAN won't have any big impact on China, one of ASEAN's largest trading partners. In reality, Russia-ASEAN cooperation is not necessarily detrimental to China, and third-party spillover effects from their trade prosperity will be likely to benefit China. Although difficulties may be encountered, the substantial growth of trade cooperation between Russia and ASEAN is still promising in the long run. In recent years, several ASEAN members sought to establish free trade pacts with the Eurasian Economic Union (EEU) led by Russia, with which Vietnam has already signed a free trade agreement. Vietnam mainly exports mobile phones, textiles, rice and machinery to Russia, and Russia supplies agricultural products, weapons and energy to Vietnam. The cooperation between Russia and ASEAN is now focused on the front and middle ends of the international industrial chain. With their economic structures changing dynamically, cooperation between Russia and ASEAN in energy processing, infrastructure construction, electric power, defense, civilian nuclear energy and high technology will also drastically expand. This bilateral cooperation may lead to a win-win situation for three parties. China's developed transportation network is now world-famous, and it will provide convenient logistics services for trade between Russia and ASEAN. Including maritime services, most of Russia's shipments to ASEAN may pass by China's territory. Although Russia has ports like Vladivostok in the Far East, the local industry is underdeveloped and few ports are frost-free, so Russia's trade with Southeast Asia will certainly rely on China's land transport facilities. China-Europe freight trains have come into service. Driven by the Belt and Road (B&R) initiative, China is active in the construction of conventional and high-speed railways in some Southeast Asian countries. For example, China is building the China-Laos railway. Once that line is connected with Thailand's rail system, the Trans-Asian Railway network will be activated. With the connection of the Eurasian Railway Network and the Trans-Asian Railway network, it will be more convenient for Russia to manage freight to ASEAN markets through China. China will not only be a country that unleashes opportunities but also a trading service provider for Russia, ASEAN members and other countries as well. This can bring economic benefits and new opportunities for China, too. Meanwhile, Russia-ASEAN cooperation will help link the B&R initiative with other multilateral systems like the EEU and ASEAN. First, Russian leaders have stressed the connection between the B&R initiative with the EEU. It is believed that connecting these two major development strategies is a crucial step in promoting the integration of the Eurasian region. Second, under ongoing, severe pressure from the West, the vigorous ASEAN region is a very attractive partner to Russia. 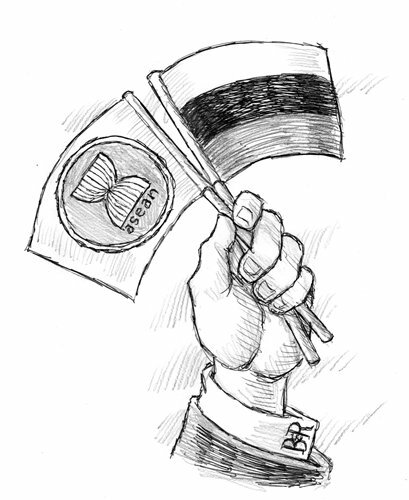 Russia will do its utmost to promote trade with ASEAN no matter how great the efforts are needed. The combination of these factors will bring historic new opportunities to the development of the B&R initiative in Asia and Eurasia. China may seize the new opportunities derived from Russia-ASEAN cooperation to strengthen cooperation among the EEU, ASEAN and the B&R initiative, by making active use of its own advantages. Efforts can be made to connect strategic meeting points, maximize mutual interests and consolidate China's strategic partnership with Russia and ASEAN. Through the efforts of all three parties, more geopolitical and economic benefits will be gained and a new international economic order will be gradually established.